Check Out Fallout 76 Camden Park and Beckley, WV! Fallout 76 is filled to the brim with places that local citizens will find familiar. But after the game’s initial reveal, there was one location I had to see for myself: Camden Park. I grew up near Huntington, WV, and have many memories of field trips, youth group outings, and weekend trips to the tiny nearby amusement park. Camden Park’s sign was shown briefly in Bethesda’s E3 Showcase, but I wanted to see more. Would Huntington be in the game? Could we cross the Ohio River? 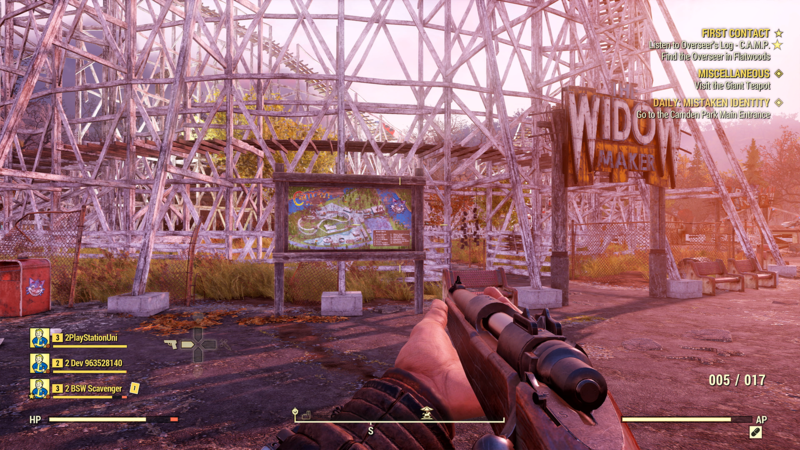 Those aren’t the only changes to Fallout 76‘s depiction of West Virginia. Beckley, WV, a city which is actually a two-hour drive from Huntington, sits atop a hill overlooking the game-version of Camden Park. That’s not uncommon within Fallout’s world: many past iterations have adjusted real-life geography to fit their fictional worlds. Fallout 76 is no exception. Even with a few downsides, it’s exciting to explore Camden Park, Beckley, and the non-existent Huntington. You can see highlights from my adventure above, which also include some decent insight into how singleplayer combat works in this multiplayer game. Though that trip ended in a death and the destination didn’t look as I expected, I’d call it a success. It’s now time to wait for the game’s full launch, so all players can take the same kind of personal quests. Fallout 76 was previewed at an event in West Virginia. Accommodations were provided by Bethesda.